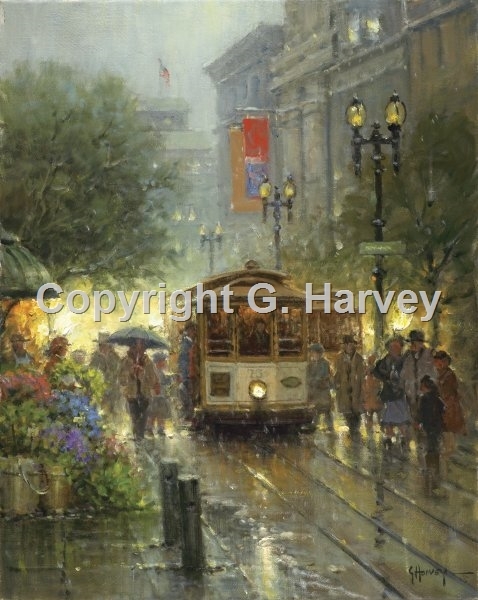 Well-known artist G. Harvey and his wife took a research trip recently to San Francisco. While there, they were charmed by quaint Powell Street where Cable Cars chugged along through the showers one afternoon. Lights reflected on the wet street making it shine like a jewel. There are two cable car lines that begin at the Powell/Market turntable. One called the Powell-Mason runs up over Nob Hill and down to Bay Street at Fisherman's Wharf. The second, the Powell-Hyde line runs over Nob and Russian Hills before ending at Aquatic Park near Ghirardelli Square. A third line, called the California, runs East-West and only crosses Powell; it runs from the Financial District, through Chinatown, over Nob Hill and stops at Van Ness Avenue.